Cut and Color Holy Cards with Triangular Crayons - Sixteen 3" x 11" heavy vellum paper (32 Cards) printed on the front and back, these coloring Holy Cards are fun and educational. 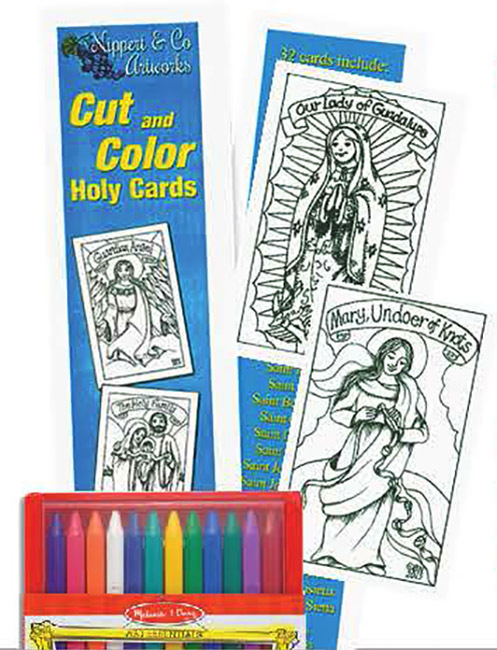 Your students will love coloring and trading them all while learning more about Jesus, Mary, and our incredible Saints! Also included in this set for your convenience is a 24 pack of Triangular Crayons. These ingenious, triangular shaped crayons won't roll away. Made of plastic, not wax, for additional durability, this set of 24-rainbow color, non-toxic crayons stay on the table- just where your little artist put them! They pack into their own sturdy, plastic flip-top case for easy clean up. The unique shape will help develop the preferred grip for later writing skills.Dimensions: 6.55" x 7.5" x 0.75" Recommended Ages: 3+ years. Holy Card images include: Holy Trinity, Jesus, Christ the King, Sacred Heart, Divine Mercy, Good Shepard, Holy Spirit, Holy Family, Our Lady of Peace, Our Lady of Grace, Our Lady of Fatima, Our Lady of Guadalupe, Mary Undoer of Knots, Guardian Angel, Saint Michael, Saint Francis, Saint Clare, Saint Joseph, Saint Anne, Saint Bernadette, Saint Cecilia, Saint Dominic, Saint George, Saint Joan of Arc, Saint John Paul II, Saint Juan Diego, Saint John the Baptist, Saint Anthony, Saint Rose of Lima, Saint Teresa of Avila, Saint Therese of Lisieux and Saint Catherine of Siena.